Surprise your lucky recipient with this perfect Valentine's bouquet of 9 Red Roses. These large, red blooms are perfectly highlighted by just the right amount of gypsophila and foliage in the form of eucalyptus and palm leaf. 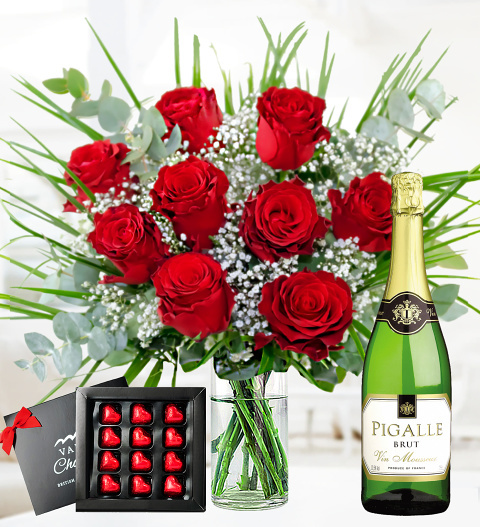 This Valentine's gift also includes a box of scrumptious chocolates, a delicious bottle of Sparkling white wine. This 9 Red Roses gift is the perfect grand gesture to send your loved one this Valentine's Day!